HUALIEN (AFP) - Four mobile cranes were used to prop up a residential and commerical complex which was left tilting perilously after the magnitude 6.0 earthquake hit Taiwan's coastal city of Hualien. Rescue efforts were suspended on Wednesday afternoon after incessant rainfall caused the building to tilt at an alarming rate of five cm per hour, reported TVBS News. The Yun Men Tsui Ti complex houses an apartment block, a restaurant, shops and a hostel. 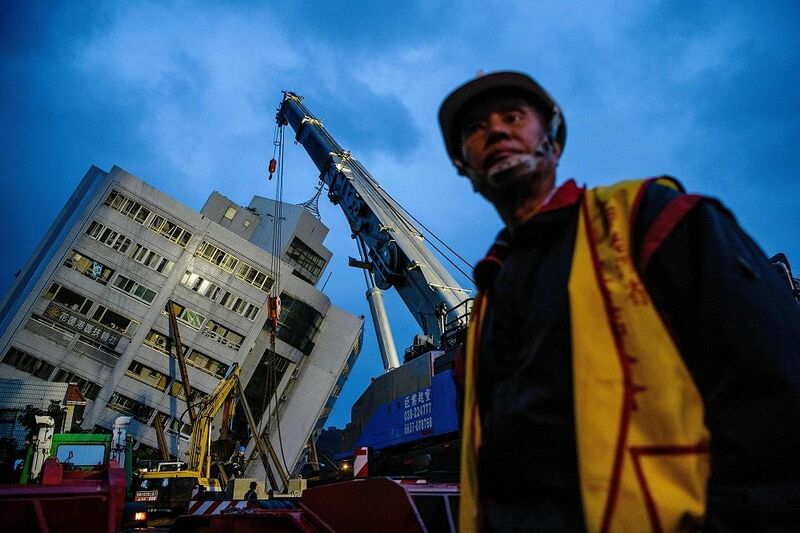 The quake left the 12-storey building leaning to one side, its lower floors crushed like pancakes. The Hualien local fire service said 147 of the 213 residents from the building remained unaccounted for. Four bodies were recovered throughout the day. "My family were unhurt, but a neighbour was injured in their head and is bleeding. We dare not go back home now. There are many aftershocks and we are worried the home is damaged," he told AFP. One resident Chen Chih-wei said he only realised an earthquake had struck when his apartment suddenly turned on its side. The 80-year-old resident was fast asleep when the tremor hit just before midnight on Tuesday (Feb 6). "Everything fell down. My bed was completely vertical, I was sleeping and suddenly I was standing," he told AFP. Chen lived with his daughter on the top floor of the Yun Men Tsui Ti residential apartment block where at least four people were killed as the building's lower floors collapsed, leaving the structure leaning dangerously at a 40 degree angle. "It (the apartment) was completely slanted and there was no way to stand. My floor is very slick so I crawled and slid my way out," he recalled. "The closets, shelf, table, they all toppled," he said. "It was hard to crawl from my bed, and there was all this stuff piled up. My feet stepped in water because the pipes burst." "It was a waste of money to buy this house nine years ago," he added. Chang Fa-an, one of the building's managing staff, said he was surprised the apartment block had failed to withstand a magnitude 6.0 quake. "When the building was first built, the units were quite expensive, the highest in the area," he told AFP. Residents occasionally came back to check on the progress as volunteer groups handed out warm meat buns in the chilly winter weather. Others set up a table with rice porridge and sushi rolls.